E-commerce (electronic commerce or EC) is the buying and selling of goods and services, or the transmitting of funds or data, over an electronic network, primarily the Internet. These business transactions occur business-to-business, business-to-consumer, consumer-to consumer or consumer-to-business. The terms e-commerce and e-business are often used interchangeably. The term e-tail is also sometimes used in reference to transaction processes around online retail. 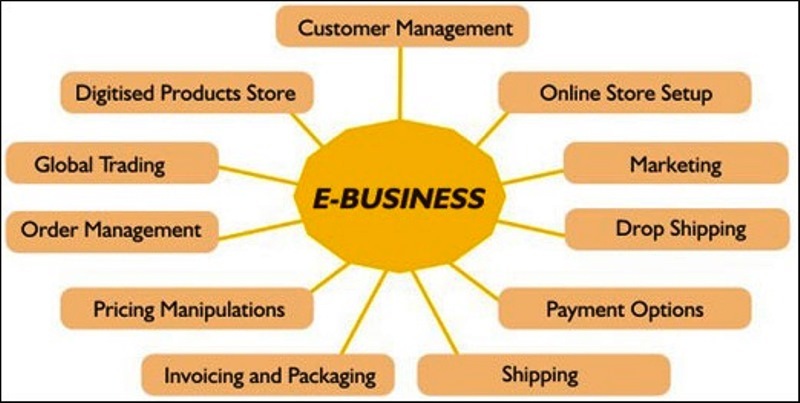 E-business (electronic business) is the conduct of business processes on the Internet. These electronic business processes include buying and selling products, supplies and services, servicing customers, processing payments, managing production control, collaborating with business partners, sharing information, running automated employee services and recruiting. Electronic commerce, commonly written as e-commerce or e-commerce, is the trading or facilitation of trading in products or services using computer networks, such as the Internet. Electronic commerce draws on technologies such as mobile commerce, electronic funds transfer, supply chain management, Internet marketing, online transaction processing, electronic data interchange (EDI), inventory management systems, and automated data collection systems. Modern electronic commerce typically uses the World Wide Web for at least one part of the transaction's life cycle, although it may also use other technologies such as e-mail. Opportunities in e-business are growing as the world becomes more interconnected on the web. 1) Information Technology (IT) plays a major role in the effective running of business. 2) Information Technology has a great influence in the way we do business. The use of right technology has the potential to revolutionize business process and organisations and make them more efficient. Mobile commerce and cloud computing has the capability to modernize the business. 3) With the help of Cloud computing we can transforms the economics hardware and software at the same time. It allows consumers and business to use applications without installing and access their personal files at any computer with internet access. 5)We just need an internet connection and we can start sending emails. The server and email management software is all on the cloud (internet) and is totally managed by the cloud service provider. 1) Cloud computing is a computing paradigm, where a large pool of systems are connected in private or public networks, to provide dynamically scalable infrastructure for application, data and file storage. With the advent of this technology, the cost of computation, application hosting, content storage and delivery is reduced significantly. 2) Cloud computing is a practical approach to experience direct cost benefits and it has the potential to transform a data center from a capital-intensive set up to a variable priced environment. 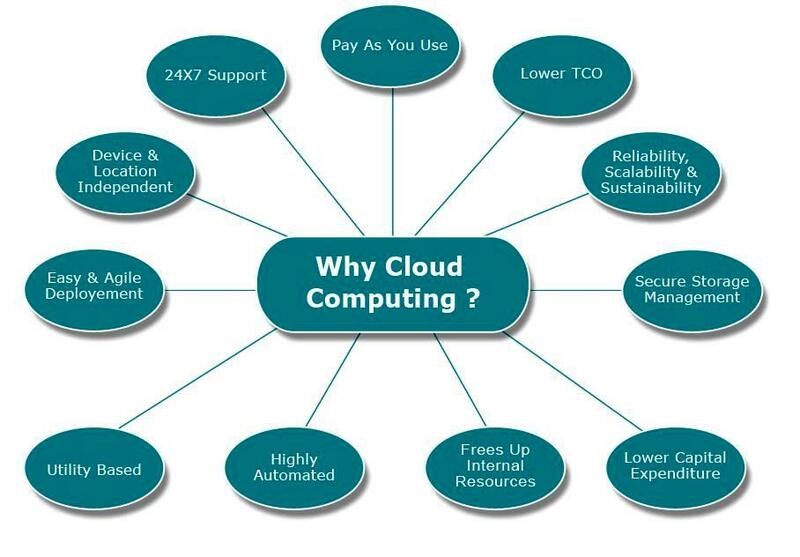 3) The idea of cloud computing is based on a very fundamental principal of „re usability of IT capabilities'. 4) The difference that cloud computing brings compared to traditional concepts of “grid computing”, “distributed computing”, “utility computing”, or “autonomic computing” is to broaden horizons across organizational boundaries. Digital marketing can assist you to effectively promote your business, products and services in a cost effective way. It will help you to communicate with your target audience utilising multiple channels with the aim of driving traffic to your website. Search Engine Marketing (SEM) is an effective way of directing traffic to your website. It comprises of two tactics, Search Engine Optimisation (SEO) and Pay Per Click (PPC) advertising. Both methods will help your website to appear in searches on popular Search engines such as Google, Bing and Yahoo! Search Engine Optimisation (SEO) aims to make it easier for your potential customers to find you online, by improving the placement of your website in search results of search engines such as Google, Bing and Yahoo! for selected keywords relating to your business, products and services. The more search engines like your site, the better chance you have of it ranking highly in search results. SEO can be an effective strategy for driving traffic to your website - in the long run. Pay Per Click (PPC) advertising is available on popular search engines such as Google, Bing or Yahoo! An advertiser is charged when their ad is clicked and a visitor lands on their website. PPC ads appear on either the Search network or Display network. Display Network ads appear on partner websites. It is a fast and direct way for businesses to start marketing online, with an immediate and measurable Return on Investment (ROI). See more information. Direct eMarketing (Email marketing, mobile SMS marketing, eCommerce and Online Advertising) is used to send a marketing message about your products, services or business to an email list. It is direct marketing using technology such as the internet and mobile phones and can be tailored to specific audiences. It is a cost effective way to send marketing messages to your current database customers and to potential customers through purchased lists. Digital Marketing Basics Email marketing and mobile marketing are an essential part of a strong relationship building marketing strategy, keeping your business in front of mind when it comes time for your customer to purchase. Social Media allows your business to promote your organisation, products and services via social media channels such as Facebook, Twitter, Google+, LinkedIn, YouTube, Pinterest and a host of other platforms. It allows your business to engage with your target audience and have real conversations in a public forum. Popular uses for businesses to incorporate social media into their business includes offering discounts to different audience segments, running competitions, providing customer service and inviting customer feedback while promoting your brand in a transparent way. Your Website is promoted through a combination of the above strategies, helping you to promote your business to a relevant, qualified target audience. They can provide either short term traffic or long term brand building campaigns. Your website needs to be professional, user focussed and the core of your online marketing efforts. As your website is your virtual storefront, it needs to be welcoming, intuitive and a reflection of your business and the reputation you’ve built since starting your business.